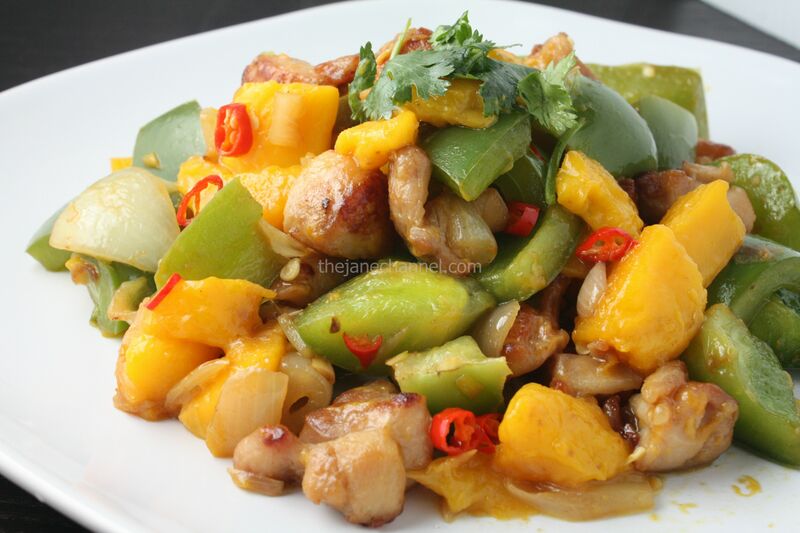 What makes this simple stir-fry special is the combination of sweet mango, hot chili, and chicken pieces. The mango really adds a whole new dimension to the dish, stimulating the appetite both in taste and appearance. Make sure that you use mangoes that are ripe, as sweetness and smoothness are what we are looking to add to the dish. Marinate chicken pieces with 1 tbsp oyster sauce, soy sauce, sesame oil, sugar, and cornstarch. Place in fridge for 30 minutes. Heat oil in skillet over high heat. Add garlic and ginger, stir until fragrant. Add onion, cook for 2 minutes then add pepper. Stir-fry for 2 more minutes. Remove from heat. In a separate skillet, heat oil over high heat. Stir in chicken pieces and cook for about 3-4 minutes until the meat begins to brown on the outside. Set aside. In the skillet, combine the chicken pieces with vegetables. Stir-fry for a minute until the chicken is cooked through. Add mango, chili, 1 tbsp oyster sauce, and stir-fry for one minute.